Brushes, paper, paints, canvas pastels, erasers, easels and essential equipment for starting an art business, just as tools, van and diagnostic equipment is to a mechanic. 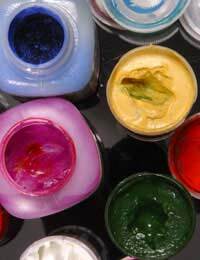 Sourcing art products from suppliers, while maintaining quality, can be difficult. Cheaper products tend to be made from lower grade ingredients and this is obvious in the finished product, whereas high grade products are expensive to buy. This is why it is vital that you find a reputable supplier who offers consistency with his products. It wastes time to have to source new suppliers every time a product range goes out of stock of artist's materials. Picking a supplier is always difficult and other artists are notoriously tight lipped on who their suppliers are in order to head off competition. Yet, if they talked to each other more they would realize that between them they could source some bargains and weed out the unreliable. Your local art society may be able to offer advice, although they may try and recruit you as a member first, and to be honest, it doesn't do your reputation any harm to say you’re a member of the local art society. In fact, it can have a positive effect on business. Members will talk more freely as most are hobby painters just looking for a friendly ear in return for help with their work. Trade magazines also offer a wealth of information about products and suppliers. Try to choose a local supplier if possible. This helps if you need a product urgently and can physically fetch the item you need rather than wait for it to arrive via the post. That said, you can get some amazing deals by importing supplies from the States, but beware of hidden import duties. This is the most cost effective way of buying products. However, beware of 'job lots' the supplier has put together for amazing prices. You may purchase one to find that they have bundles together all the colours or products that are slow to sell. It is often better just to purchase what you need, if it is on special offer, great, if not you haven't ended up with unusable items. Try to order no more than once a month, if possible, as this will save on carriage costs and will prevent stock taking up valuable space. Work out your minimum stock level and when you get there, it's time to order. If you are trying a new product, ask for a sample before placing large orders only to find you can't work with it. Reputable suppliers will normally send out samples of paper, pencil and paint to try. It is advisable, though, that in the case of brushes that you go to your local art shop and look and feel the brushes. There is a wide range available from cheap student grade up to fine sable brushes. Brushes really are personal choice rather than standard. Once you have a supplier you're happy meets your needs, then stick with them. If it becomes necessary to change supplier, so your homework and check they stock the products you use. It's quicker, cheaper and easier to get most of your equipment from one supplier.